It won’t be long now before we advertise the new round of our Visiting Fellowship competition, but in the meantime we have some other news – we are delighted to tell you that we will be welcoming Dr Giorgos Bourogiannis to Cambridge as an externally-funded CREWS Visiting Fellow next term! Read more about his project below. Giorgos is an archaeologist and postdoctoral research associate at the National Hellenic Research Foundation in Athens. Since his PhD (2008) he has worked as a curator for the Naukratis project at the British Museum, Department of Greece and Rome, and has held the A.G. Leventis postdoctoral position at the Museum of Mediterranean and Near Eastern Antiquities (Medelhavsmuseet) in Stockholm, studying the unpublished evidence from the sanctuary of Ayia Irini on Cyprus (you can see a video about his work HERE). A quick post to let you know of an article I wrote on the syllabic writing systems of the ancient Aegean and Cyprus (though excluding Linear B). 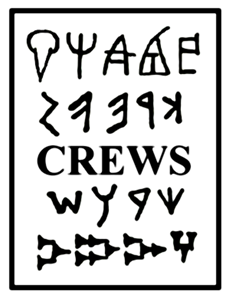 This was for the catalogue of an exhibition at the Fitzwilliam Museum called Codebreakers and Groundbreakers, which examined Michael Ventris’ decipherment of Linear B alongside Alan Turing’s breaking of the Enigma Code. Other chapters in the volume focused on Linear B, while I was asked to write about the related syllabic writing systems of Crete and Cyprus.